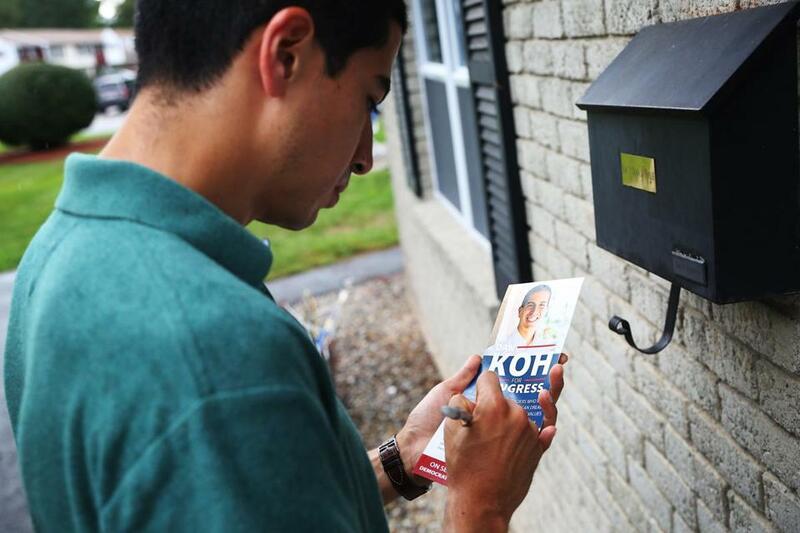 Third Congressional District candidate Dan Koh writes a note to a voter while canvasing in Haverhill. Koh is one of three candidates of Asian-American heritage in the district race. Asian-Americans in Massachusetts have run for mayor (Sam Yoon, Boston), and some have even won (Lisa Wong, Fitchburg). They are city councilors (Nina Liang, Quincy; Michelle Wu, Boston), and lawmakers on Beacon Hill (Tackey Chan, Donald Wong). But Congress? That barrier hasn’t been broken yet, but this may be the year. Just take a look at the Democratic field in the Third District: Three out of the 10 candidates are Asian-Americans — Beej Das, Dan Koh, and Bopha Malone. “It’s not only that they are among the first Asian-Americans to seek office at this level in our state, but they represent the diversity among Asian-Americans,” said Paul Watanabe, director of the Institute for Asian American Studies at the University of Massachusetts Boston. Das, a hotel owner, is the son of Indian immigrants. Koh, the former chief of staff to Boston Mayor Marty Walsh, is half Korean and half Lebanese. Malone, a bank vice president, fled Cambodia’s Khmer Rouge regime when she was 3 and spent much of her childhood in refugee camps before immigrating to the United States. Bopha Malone greets voters at the Lowell Southeast Asian Water Festival on Aug. 18. Only 18 Asian-Americans or Pacific Islanders serve in Congress, according to the Asian Pacific American Institute for Congressional Studies. But the desire is there for more: The Associated Press estimates that at least 80 Asian-American candidates are running for Congress nationwide. They’re not all a long shot, either. 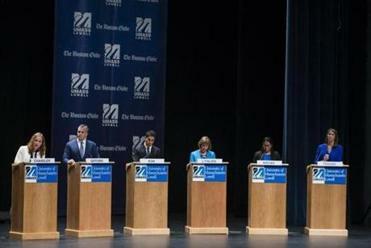 In fact, Koh — with his ground game and sizeable war chest — has a small lead in the crowded field in the Third District, according to a Boston Globe/UMass Lowell poll released last week. Still, many voters are undecided heading into the Sept. 4 primary, and a victory will require broad appeal not just garnering Asian-American votes. The campaign’s waning days have been heated with challenger Barbara L’Italien going negative on Koh. Asian-Americans are the fastest growing minority in Massachusetts, according to the census, yet it was only a decade ago when the first Asian-American got elected to the Legislature. That was Sonia Chang-Diaz, who beat incumbent state Senator Dianne Wilkerson. Chang-Diaz — who is part Chinese, part Hispanic — is also the first Latina elected to the state Senate. Then came the wave. In 2010, a trio of Asian-Americans won state representative races: Democrats Tackey Chan of Quincy and Paul Schmid of Westport and Republican Donald Wong of Saugus. More have since joined their ranks on Beacon Hill: Republican Keiko Orrall of Lakeville and Democrat Rady Mom of Lowell. Then there’s Republican state Senator Dean Tran of Fitchburg, who won a special election last year. 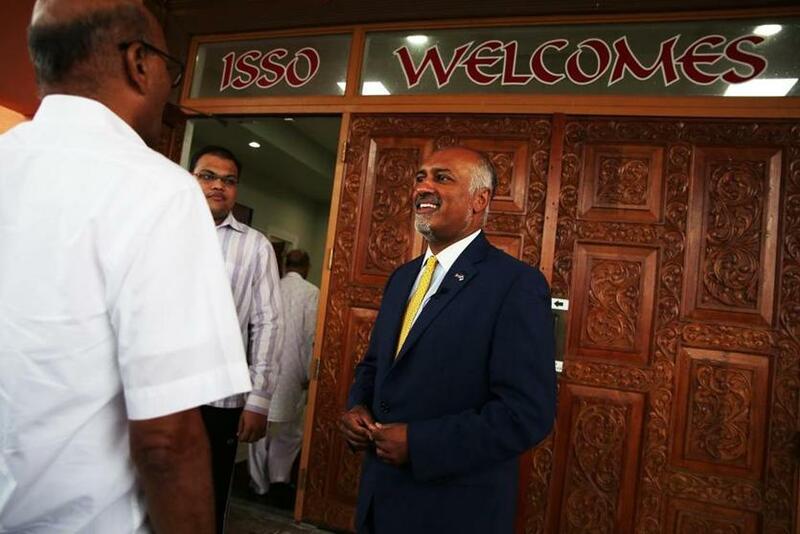 Beej Das spoke with voters at the ISSO Shree Swaminarayan Temple in Lowell on Aug. 18. Orrall is now running for state treasurer. Other Asian-Americans seeking office include Linda Champion for Suffolk County District Attorney, and a bunch vying for state representative seats, including Lynn City Councilor Hong Net, former state economic official Eric Nakajima, and legal aid attorney Tram Nguyen. And if you need proof we may have reached a critical mass, how about this: In one Lowell race, there are two Cambodian-American candidates — Sam Meas and Rithy Uong — who are running against Cambodian-American incumbent state representative Mom. Talk to Boston City Councilor Michelle Wu, and she sometimes has to pinch herself to think of where she is. In 2013, she was the first Asian-American woman elected to the council and three years later became the first woman of color to serve as its president. For donors like Leverett Wing, it’s about time he can write a check supporting an Asian-American running for federal office in Massachusetts. “It’s a watershed moment for our community to have three very qualified candidates running for Congress,” said Wing, a Boston political organizer and fund-raiser who is backing Koh. Asian-Americans are the fastest growing minority in Massachusetts. Wing hopes for a historic win in the Third District, but he’s already dreaming about what could be next. Shirley Leung is interim editorial page editor of the Globe. Follow her on Twitter @leung.